Intelligence analysts have given investigators documents they say show senior military officials distorted reports on the progress made against ISIS, The New York Times is reporting. A spokeswoman for the Pentagon’s inspector general told the Times the investigation is focused on the intelligence command at Central Command, which oversees U.S. military operations in the Middle East. An unnamed government intelligence analyst told the newspaper the complaints involve senior officials in the unit. The New York Times reported last month that the investigation had begun, but the scope of the inquiry and the focus of the allegations were unclear. The officials now say that the analysts at the center of the investigation allege that their superiors within Centcom’s intelligence operation changed conclusions about a number of topics, including the readiness of Iraqi security forces and the success of the bombing campaign in Iraq and Syria. The issue is likely to be raised Wednesday when Gen. Lloyd Austin, who oversees Centcom, testifies before a Senate panel on the military operations against ISIS. The matter is complicated because the analysts who made the complaint work for the Defense Intelligence Agency — it was created to be immune from the pressures and biases of the officers leading the war — but are supervised by officers at Centcom. At least one analyst complained to the inspector general in July. Last week, The Daily Beastreported that those complaints were supported by a cadre of more than 50 intelligence agents. ISIS controls large parts of Syria and Iraq. But U.S. and allied airstrikes against the group are focused mainly on Iraq. The strikes have had limited success. 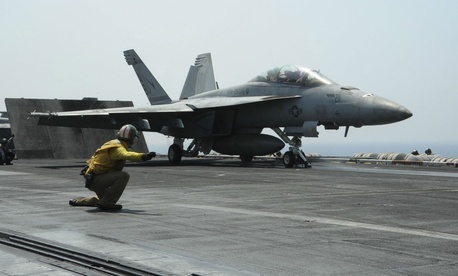 On Wednesday, Australian warplanes made their first strikes against ISIS targets. France is expected to join those efforts in the coming weeks.